Aaron Ebersol, 32, left the Amish community 17 years ago when he could no longer bear the restrictions or the constant tension with his father. He?d written too many unanswered letters to his mother and found himself incapable of putting down any roots in his new home in Missouri. Success in work could not replace the family that denied Aaron, even after all of these years. Aaron hastily returns to the Amish community of Paradise, PA, after receiving word of his mother's stroke. Hesitant to get too close to the family he was once a part of, he decides to stay at the Heart of Paradise Bed & Breakfast. He soon encounters Linda, working there part-time, and they begin to develop a friendship. Aaron's return allows him to reconnect with his family as he jumps into home improvement projects, hoping to make his parents? house more accessible to his handicapped mother. But before long, he is enraged to learn that his brother, Solomon, had hidden all of Aaron's letters to their mother. 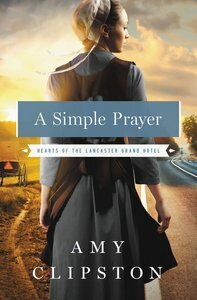 About "A Simple Prayer (#04 in Hearts Of The Lancaster Grand Hotel Series)"
Order now to secure your copy when our stock arrives. Other edition is available. 9780310350736 0 Available. Expected to ship in 6 to 7 weeks from Australia.